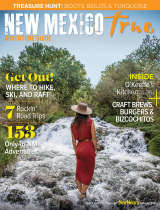 New Mexico True “Tourism Talk” is a bi-weekly digital newsletter distributed by the New Mexico Tourism Department to inform members of NM’s tourism and hospitality industries of marketing and partnership opportunities, along with travel news and updates from industry partners. To receive Tourism Talk please fill out the short form below. We use a secure Mail Chimp server and we will never share, sell, or otherwise use you information for anything except to provide you with information directly from the department.